For the longest lasting repair, some preparatory work needs to be done. Clean out any loose plaster that you can see between the lath and around the perimeter of the hole. 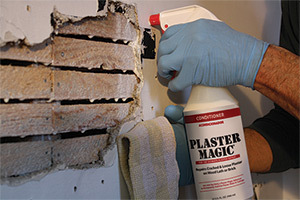 Stabilize the existing plaster using a Plaster Magic repair kit by gluing the loos plaster to every strip of lath around the perimeter of the ole, or every 2″ around the hole for wire lath. After the adhesive has been applied and the plastic clamps are in place, spray the wood lath and raw edges of the existing plaster again with Plaster Magic conditioner three times (let it soak in before you spray the area again). Allow the stabilized plaster to set up overnight. Hint: The more irregular the holes is, the easier it is to hide; the better the mechanical bond (i.e. 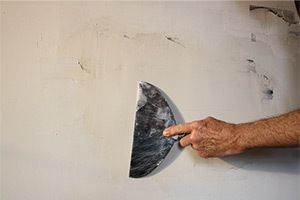 due to the rough edges of the existing plaster), the harder it is to see after the repair. Once the perimeter of the hole has been stabilized, mis up the Plaster Magic patching plaster. The goal is to make enough mix to fill the hole halfway for two layers or – if the hole is smaller than your hand – fill in one layer. Pour some of the dry mix into the plastic mixing container. Add a small amount of water, stirring into the patching plaster to create a peanut butter-like paste (it’s much easier to add extra water than it is to take it out). Tuck the patching plaster under the edges of the existing plaster and into the key ways (the spaces between the lath). Scratch the surface of this first layer of patching plaster with the corner edge of the putty knife to provide texture for the next layer of patching plaster to bond to. Let the first batch of plaster set up, approximately 1-2 hours. 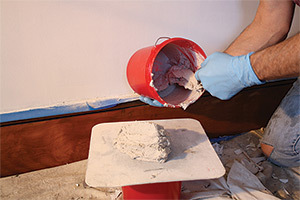 Mix and apply the second layer of plaster to fill the hole. 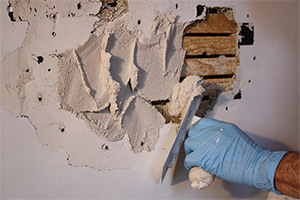 Remove any dried patching plaster left on the surface of the existing plaster with the putty knife. Apply a topping of joint compound to fill in any cosmetic defects. Let dry and lightly sand. Use warm, soapy water to wash utensils. DO NOT empty any patching plaster into sink. Store dry mix in a sealed plastic bag in a cool, dry place.